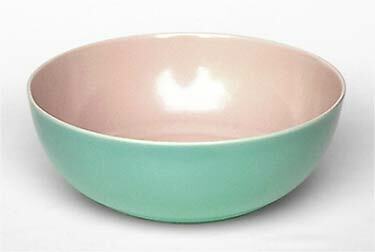 Branksome Graceline bowl - 8¼" (209 mm) diameter, 3" (76 mm) high. The Branksome company has been owned and run by the Baggaley family since it started in 1945. Ernest Baggaley had come from his home in Stoke to work for Poole Pottery in 1936 and remained there until the end of the Second World War. The Branksome factory, originally at Surrey Road, Bournemouth, moved to nearby Westbourne in 1957 following financial difficulties brought on by enlargement, and then again in 1966 to their present home in Fordingbridge, Hampshire. In the early days Branksome were very successful with their hard-wearing china ranges which they styled Felspathic Fine China. A particularly popular design was Graceline, a range of twin-tone pastel tableware made in sixteen colourways. Graceline is now much sought-after by Branksome collectors and 1950s enthusiasts. The Branksome animal figures, introduced in the 1950s are also widely collected. In recent years staff has been kept to a minimum - a tenth of the number employed in the 1940s and 50s - but the wares are still hand painted and finished. Underglaze oxide colours are brushed on before application of a clear glaze and firing in a large capacity electric kiln.